When I was a kid, nothing would get me too the table faster, than when my mom would utter the words, “We’re having Cajun shrimp for dinner”. It was one of those screw the forks, dig in with your hands meals. Every child for themselves. By the time you finished you were covered in a mildly spicy butter wine sauce from head to toe, and were deeply considering using a loaf of sour dough to sop it off yourself. It was gluttony at its finest. The best part about this dish is, (besides the amazing taste) it takes about 15 minutes to make. Now I know there’s some aficionado out there saying “THAT is NOT Cajun.” To them I say, you are correct sir or ma’am. Its a little bit spicy, a little bit smokey, but yes, it is missing several things. I’m unsure if those things would take the sanctity and simplicity out of what this dish is. Cajun shrimp what we call it at home, and it tastes delicious. Would you settle for almost Cajun shrimp? Cube your butter and melt it in a large pan. Once the butter has melted, add in white wine, lemon juice, chili peppers, salt, pepper, and liquid smoke. Bring that to a high simmer and begin putting in your shrimp. I do this in batches so that it cooks evenly. It usually takes only two or 3. On the last batch throw in your green onions. 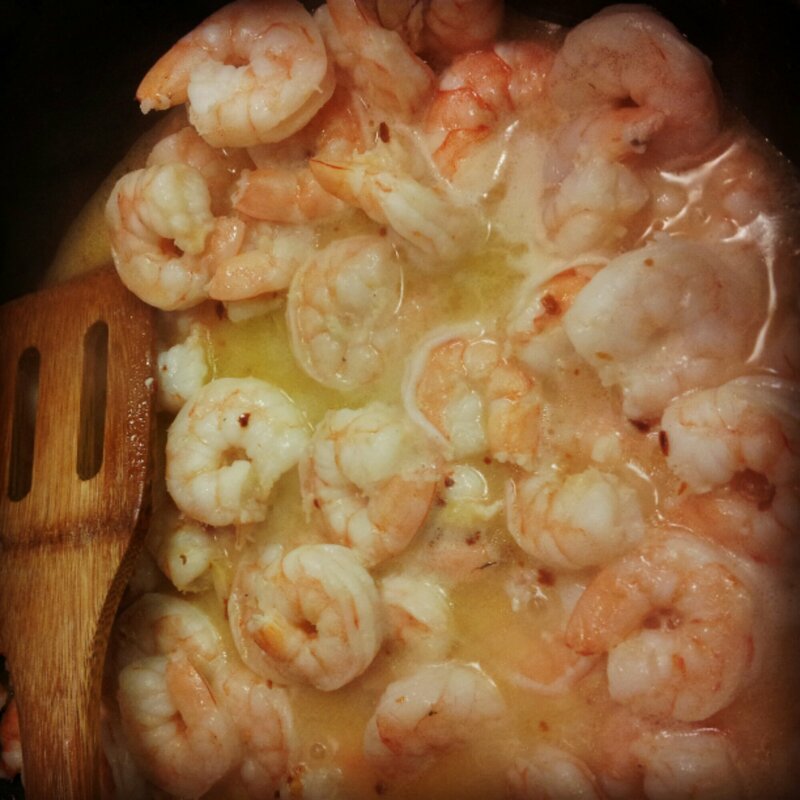 Place your shrimp in in a large bowl and pour the sauce over top. Serve it with a large loaf of warm sour dough, and commence stuffing your face. Hint: to slow the pace of your kin that have a tendency to eat with gusto, leave the shells on. It makes you work a little for your food, and its like a extra special flavor savor, that encloses the shrimp in the sauce. 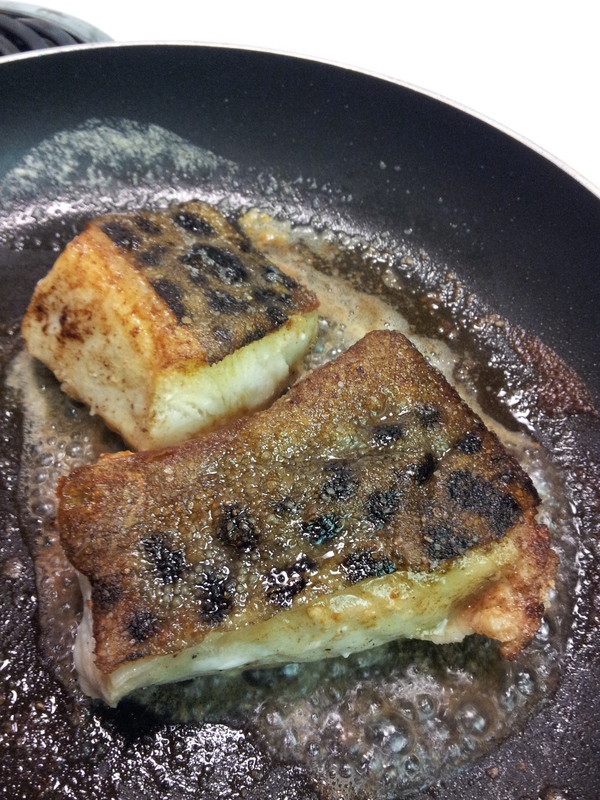 Norwegian wolf fish, Its more delicious than it looks! I found Norwegian wolf fish this summer at Trader Joe’s. It’s spotted like a cheetah, and makes lofty claims that it tastes like shell fish. So of course I started googling recipes. Almost all of them stated that it was a terrible tasting fish. The key to it being terrible tasting was the way it was prepped. Different kinds of fish deserve different methods of preparation. It appears that people cooking it, decided to make it like a salmon. Basically putting tomato, onion and lemon juice on it and baking or BBQing it. The key to making wolf fish taste good, is the skin. It’s a scaleless fish. The skin is incredibly tough, and it has rather mobile layer of connective between the skin, and what actually tastes good. In my mind, I imagine the wolf fish being the Eeyore of the Norwegian Sea. It spends all day crunching up shellfish, and absorbing boat engine oil, and sadness. As soon as you remove its skin, and connective tissue, It becomes a delcious fish again…. Apparently I am the buffalo bill of the Norwegian Sea. It rubs the butter on its skin! Since I got my fish at trader Joe’s, it was frozen. I set it out that morning and let it thaw. I then washed it, gave it a gentle squeeze to get the rest of the juice out, and patted it dry. Melt your butter in a frying pan, and turn it on the high side of medium high. Place it on the fry pan skin side down, and let the skin get crispy, and melt that layer of tissue on the underside. Give it about 10 minutes. (I know that is a scary thought, but Its not a normal fish.) Drop your heat down a couple notches to medium high, and flip it . While it’s cooking the flesh (about 5 minutes), lift off the skin and chuck it. Then take a knife and gently scrape off that extra layer of tissue underneath the skin. It’s like a gelatinous goo. Scrape until there is no more goo, and you are down to the flesh level, flip it one last time and sear in that deliciousness. You will know its finished when you can easily separate it with a fork. I served mine with a beurre blanc and asparagus. Perfect Wolf fish compliments. To bisque or to chowder, was the question of the day. Whats the difference you ask? Chowders have chunks. The potatoes, meat and veggies are all intact, creating individual bites of flavor magic. Bisque is thought to have originated in Biscay Bay, and is a puree of all the deliciousness that you put into it. I decided on bisque because I have an awesome hand blender that I plan on over using until its motor blows. I chose nova lox for my smoked salmon. Remember, not all smoked salmon are created equal, or the same. I live in the great Pacific Northwest. Our smoked salmon is almost a jerky. Don’t get me wrong, its quite flavorful and delicious. Excellent on a cracker with some cream cheese, but its not the delicate flavor I was searching for. The first time I had cold smoked salmon, it was sold to me by my massage therapist. Funny place to get it right? But who the hell could resist a moist smoked calico salmon that almost melts in your mouth. It was at that moment that I really started exploring my smoked salmon options. Lox are cold smoked, and every time you eat it, tiny angels sing as you take a bite. Its moist, and delicate. It falls apart in your mouth. Its exquisite on a bagel with cream cheese. It also is the perfect seafood for my bisque… Yaaaay! Bring 3 cups of chicken broth to a simmer. Cut the top off your tomato, and drop it in until the skin begins to peal off. Remove the tomato and pull off the skin, cut it in to quarters and put it back in. Add your potatoes, onions, garlic, and celery. Turn the heat to medium high and drop in your chardonnay and lemon juice. Let your alcohol simmer off (you’ll know when the scent stops biting your nose). Add in your paprika, smoke, dill, and cayenne pepper. Once your potatoes are soft, take the soup off the burner and add and stir in the heavy cream. Here’s the important part, chop up the smoked salmon and throw 3/4 of it into the soup, and use your hand blender to puree the mixture ( or pour it into your regular blender). 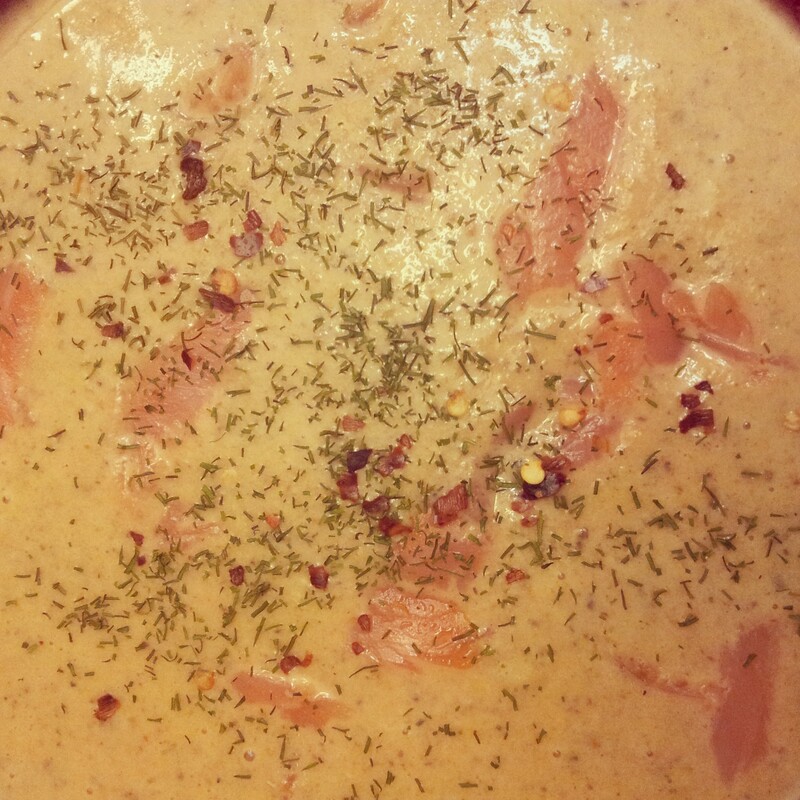 Pour your delicious bisque into bowls for serving, and sprinkle the rest of the bits of smoked salmon over the top. Its Christmas cookie season! Time to put on no less than 7 pounds and eat as much magical deliciousness as you can fit in your belly. My great Aunt Eilene had an amazing fudge recipe that has been lost and found many many times. Its not too hard, its not too soft, it pours perfectly and tastes amazing. So of course I had to take it and make it just ever so slightly my own. 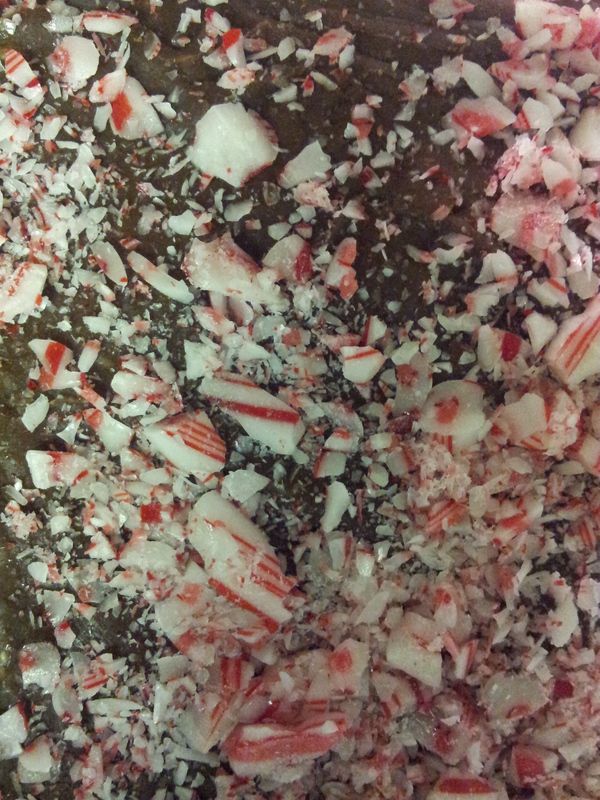 I added peppermint extract to it, and bashed the hell out of some candy canes and sprinkled them on top. There is a secret to making this recipe. The weather has to be just right. Just below freezing and a bit dry. The freezing weather creates the perfect temperature for your fudge to set and cool. Once this recipe gets started,everything gets added in really quick so line up your ingredients and get your stirring arm ready. First! Make your crushed candy canes. Your best bet is to stick them inside of a ziplock bag, and take out all your aggression on them with your rolling pin or meat tenderizer. Set them off to the side. In a large pot add the sugar, butter and evaporated milk. Turn your heat to medium, and slowly but constantly stir it until it hits a rolling boil. Stir it while it boils for 10 minutes. If you have ever had boiling sugar land on your skin, you know to wear a long sleeve shirt (it hurts like hell, and burns for a bit longer than if you had hot grease land on your skin). Once your 10 minutes are up immediately remove it from the heat and add in chocolate chips, vanilla and peppermint extract, and (if you want them) your walnuts. Stir until all the ingredients are well mixed and smooth. Pour into two 9×9 square dishes, approximately 1 inch thick, sprinkle candy cane crumbs over the top, and set it out on your back porch to cool in the blisteringly cold weather for 1 1/2 to two hours…. or you could use a freezer… like a normal person, but wheres the fun in that? On weekends like this when its too cold and dry to frost, and going outside results in chapped lips and frostbitten earlobes, nothing beats a mug of hot chocolate. 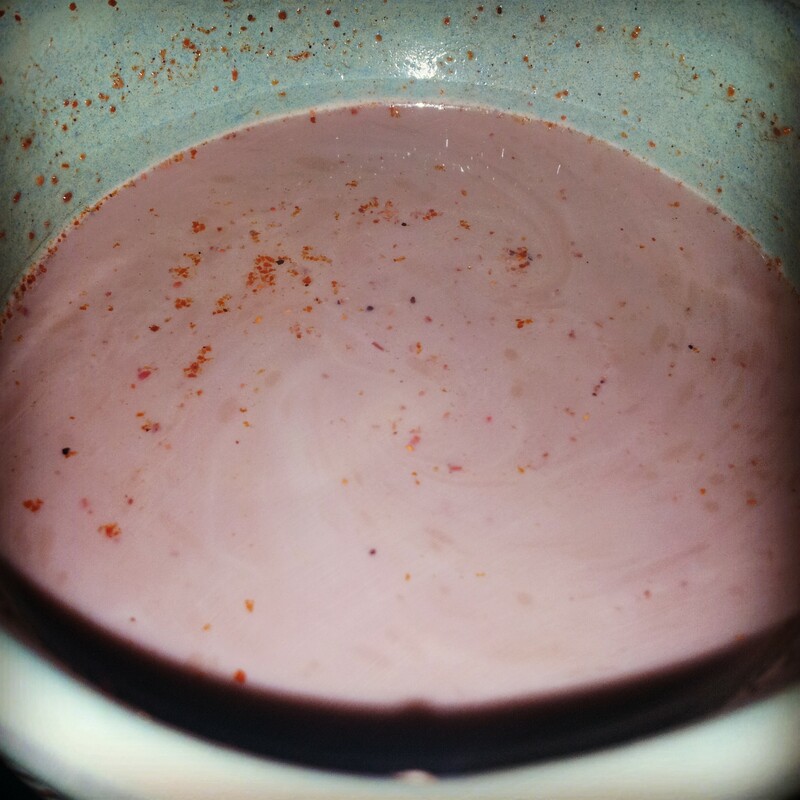 I used to reach for the Nesquik, until I had Mexican hot chocolate. There’s something to be said for super old recipes that stand the test of time. I’m certain that I’m bastardizing it, as there is no Aztec emperor to make it for me. However, this is my recipe for it! Mexican hot chocolate for two! Heat up your milk until it is just steaming. Add the unsweetened chocolate powder, and whisk it in. Add the salt, sugar, cinnamon cayenne pepper and chili powder. Whisk in the rest of your ingredients, and serve it up.